I have often made the point, when teaching various Bible classes, that, in Christianity, theology and anthropology are inextricably intertwined. You can’t really understand anthropology if you don’t understand theology and you can’t really understand theology if you don’t understand anthropology. Apart from an understanding of God’s verdict on us as sinners, we are all too readily tempted to think of ourselves as better, nobler, and loftier than we really are. Thus, in order to truly understand the peril of our sinful state, we must understand what the Bible says theologically about our brokenness anthropologically. I bring all of this up because I have been doing some thinking lately about the anthropological side of Christianity. And what I have come to realize is that while Christian authors, pastors, and leaders will spend a lot of time addressing the anthropological side of Christianity on a micro scale, sometimes, macro anthropological concerns can get marginalized. Here’s what I mean. The Christian arena is replete with resources on marriage, addiction, finances, relationships and other personal, or micro, concerns. And these resources are needed and, I would add, popular! What is less popular in our day, however, are resources that address macro anthropological issues of cultural trends, power structures, injustice, and societally systemic sins as well as their broad historical and philosophic foundations. Part of the reason I would guess these resources are less popular is because addressing macro anthropological issues is an inevitably more complex, convoluted, and academic exercise than addressing micro anthropological issues due to the sheer size and the extended historical timelines of these macro anthropological issues. Furthermore, because it is the micro anthropological concerns that most directly and immediately affect us, it is easy to look at what only directly affects us right now than consider the broader concerns of our world over time. 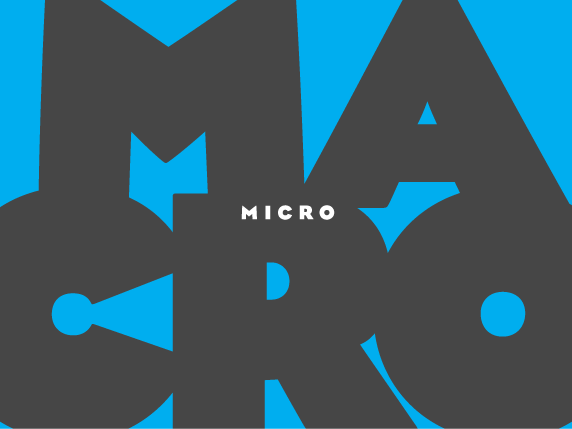 Make no mistake about it: God cares about the micro. He cares about your tears and your pain and your worries and your regrets. But He will fix your micro concerns in His macro way: He will make everything new. So perhaps we should spend a little more time thinking about “everything” that God will make new and a little less time thinking only about our micro concerns. Entry filed under: Current Trends. Tags: Anthropology, Christianity, Church, Depravity, Macro, Micro, Religion, Self-Help, Spirituality, Theology. Hi, Zach. As always, great post. Had to read it a couple of times, but great post nonetheless. I wonder about the emphasis, near infatuation, with the micro at the expense of the macro is precisely because of a fundamental misunderstanding of God’s verdict on us as sinners. The micro gives us a more favorable picture of ourselves, while the Biblical understanding of sin is that it is a condition and corruption into which we are all born. If we understand anthropology in a macro way, as God does, then all things must necessarily be made new, for the old is dying and corrupted.